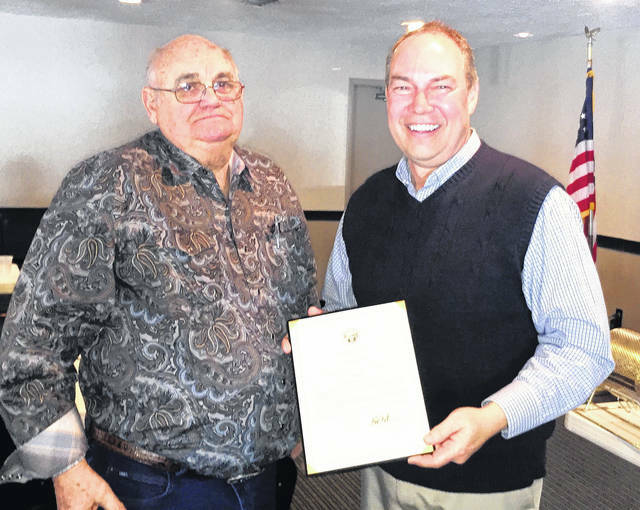 State Sen. Bob Peterson presented citations honoring Bill Butler of Union Stockyards (above) and local farmer Ken Davis at Tuesday’s Hillsboro Rotary Club meeting. Davis’ son, Evan, accepted the citation on his father’s behalf. The take from last week’s radio-telethon for the Highland County Society for Children and Adults surpassed $99,000 on Tuesday after a quick collection was taken at the Hillsboro Rotary Club meeting, where members also heard from state Sen. Bob Peterson, who honored two local individuals involved in the agriculture industry. 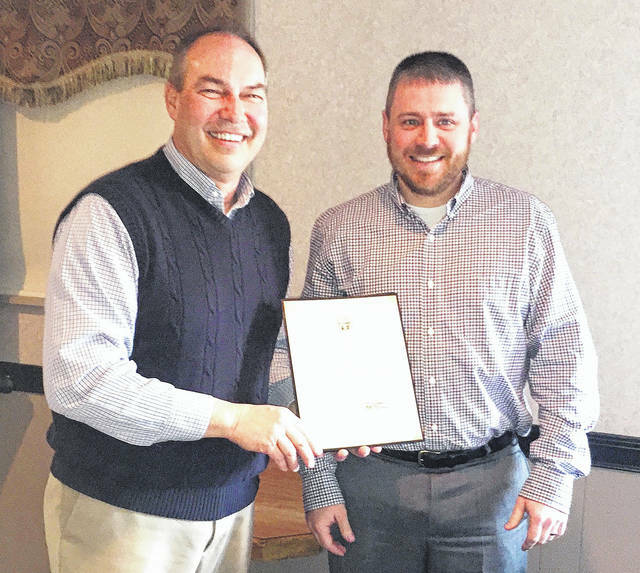 Tuesday was “Ag Day” at Hillsboro Rotary, but early in the meeting, Rocky Coss, the Highland County common pleas judge who leads Rotary’s efforts for the radio-telethon, told members that with additional contributions, $98,770 had been raised. That prompted Rotarian and local veterinarian Rob Sharp to pass a basket around the tables, encouraging members to boost the total above the $99,000 mark. When the collection was counted, Coss said it had netted another $492, bringing the grand total to $99,262, well above last year’s total of just over $96,000. The radio-telethon is named in honor of the late Ernie Blankenship, the longtime local sportscaster who led the fundraising efforts over the years. Numerous Rotarians brought guests with them Tuesday who are involved in the ag industry, and Peterson, himself a farmer, touted farming and its importance. He discussed bills related to agriculture, including a new regulatory reform bill. Peterson said Ohio ranks high in the number of state regulations, with 246,000 on the books, compared to a national average of 148,000. Peterson also presented citations to two local individuals involved in agriculture, saying Bill Butler, owner and manager of Union Stockyards, “has helped lead change” in the ag industry over the years, while noting that local farmer Ken Davis is “innovative” and has served on many boards and commissions to promote agriculture. Davis’ son, Evan, accepted the citation on his father’s behalf. Peterson is a Republican state senator from the 17th District and a former Fayette County commissioner. He was introduced by Rotarian and Highland County Commissioner Shane Wilkin. https://www.timesgazette.com/wp-content/uploads/sites/33/2018/04/web1_Butler-Bill-rotary.jpgState Sen. Bob Peterson presented citations honoring Bill Butler of Union Stockyards (above) and local farmer Ken Davis at Tuesday’s Hillsboro Rotary Club meeting. Davis’ son, Evan, accepted the citation on his father’s behalf.